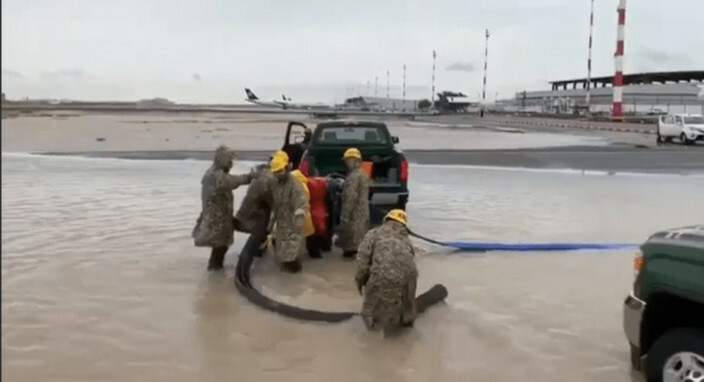 Kuwait started massive rescue and clean up efforts as three days of unprecedented rains which brought the country to a standstill eased on Friday. The rains caused flooding which disrupted life, shut offices and schools, stalled flooded streets, submerged cars and inflicted property damage. Kuwait Parliament Speaker Marzouq Al Ganem promised compensation for those whose properties were damaged by the floods. On Friday civil defence workers intensified their efforts to pump out flood water inside two tunnels and along some roads. Efforts to restore electricity to homes which lost power were also underway. According to reports, Kuwait experienced 245mm of rainfall over three days until Thursday, breaking the 1997 record of 64.1mm. A spokesperson for Kuwaiti Civil Defence said they had sheltered 148 persons in 29 hospitality flats in the Ahmadi governorate. The civil defence on Friday said it had responded to 6,089 emergency and inquiry calls in 24 hours. Both the Kuwaiti emir and the parliament speaker lauded the efforts of the public sector in dealing with the floods. Al Ganem wrote on Twitter that Kuwait has experienced a wave of unprecedented heavy rain “without recording fatalities or serious injuries”. Authorities continued to urge people to stay indoors for their own safety as well as not to hamper rescue efforts. People were also cautioned not to fall prey to baseless rumours circulating and to get their news from official television and social media accounts. Meanwhile, Prime Minister Shaikh Jaber Mubarak Al Hamad Al Sabah, called on people to come together to get through the difficult conditions warning that the crisis was “not yet over”. He called both the downpour and the rescue efforts that the country had witnessed “unprecedented”. He added that he deplored attempts to frustrate rescue efforts. On Friday Kuwait’s meteorological department of the General Directorate of Civil Aviation (DGCA) predicted sporadic rainfall and fog in some areas. Kuwait Ports Authority announced on Friday the resumption at 8am of maritime traffic in the port of Shuaiba after the weather conditions and visibility improved. The port, 45km south of Kuwait city, features 20 berths for commercial goods and others for containers and a pier for petroleum products. The Public Authority for Roads and Transportation (PART) said some roads would be partially closed, but warned that others would be completely shut to traffic following the heavy downpour on Thursday night. On Thursday, Kuwait’s airport was briefly closed due to the floods causing interruptions in regional flights flying to and from Kuwait, however, by 4pm most flights had resumed.